Team Sanya are making the long and lonely slog back to New Zealand after suffering catastrophic damage to their boat in the Southern Ocean. The Chinese-flagged entry, skippered by legendary Kiwi sailor Mike Sanderson, were leading the fleet 1500 nautical miles into the gruelling leg to Brazil when they snapped the starboard rudder of their boat, tearing a hole in the hull. The breakage happened as Sanya were travelling at high speed and immediately sent the boat into a crash gybe, with water pouring into the aft compartment. 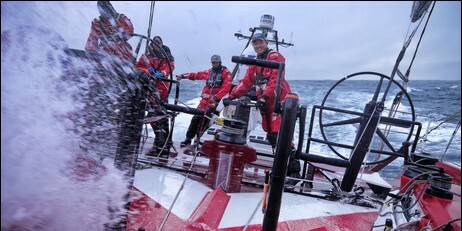 After saving their boat from sinking and patching up the hole, the team assessed the damage before coming to the devastating realisation that they had no other option but to pull out of leg 5 to Brazil and return to New Zealand. "It’s unbelievable, I’m just lost for words," said Sanderson. The team was last night weighing up which port they would return to, with Wellington or Tauranga the most likely options. They are not due to arrive back in New Zealand for another 3-4 days. Back in port, the Sanya crew will get the damage repaired before deciding their fate in the remainder of this race. "It will be what it will be," said Sanderson. "But we’ve just got to really focus on getting the guys back there safely and getting our boat back there so we can live to fight another day." On the Volvo Ocean Race website, Sanderson described the dramatic moments that followed after hearing a "loud bang". "The rudder snapped in between the boat and the deck which is just the worst thing that can happen because then it just leverages itself off the boat and leaves a pretty messy trail," he said. "We had to save the boat. We had the whole aft compartment full of water, about three to four tonnes, and it was pressing." The damage to the starboard rudder immediately sent the boat into a crash gybe and laid the boat almost flat, which took considerable time to recover from. "Suddenly we’re pinned on our side dragging the sails through the water with a lot of heel on," he said. "We had the keel out the wrong side and the sail stack all on the wrong side. But you know, it’s just a process you work through and take your time." At the time, Sanya held a slim lead over four other boats in the main pack with around 5500 nautical miles to go to the finish line. For Sanderson this has made the current situation all the harder to swallow, particularly after putting on an impressive performance during the Auckland stopover. "We were really pleased we were in a lead and in a really nice spot to extend our lead. "We were sailing along pretty fast, between 20-30 knots of boat speed in nice conditions," he said. "We’re just gutted, it hasn’t even quite sunk in for sure." It is the third big setback suffered by Sanya since the start of the race after suffering bow damage shortly after leaving Alicante on leg 1. The team then broke a key piece of rigging in the second leg. Late last night Team New Zealand were leading the fleet as the teams try to make their way around the ice exclusion zone. The Camper crew held a narrow 5.2-nautical-mile lead over Groupama, with Team Telefonica a further 19 miles back in third. Telefonica are being closely pursued by Puma, setting up the possibility for further positional changes over the next 24 hours.